Delta watched as Francois gulped down another cream coloured mushroom; he looked to be rather enjoying it. The mushroom had taken a little over an hour to develop but when it finished, a little kitchen timer in Delta’s head went off. It was cute, the noise, but Delta suspected she was being made fun of. Crunchy Mushroom: 3 Mana. A slightly odd mushroom that, while not all that good, can provide some nutrition. Leaves an aftertaste that lingers. These mushrooms were just pale and featureless. Unlike the Gutrot, which were evil, these mushrooms seemed to make her little goblin happy as he chewed. Delta made a face as Francois smacked his little face. Though… that might be due more to the simpleness of a goblin mind that any refined palette. Leaving the goblin to eat the rest of her harvest, Delta went to ponder what her dungeon had… and didn’t have. Gob and Hob still hadn’t returned with the water. She hoped they were alright, sure they were her only means of collecting resources and cheating the system but Delta was more concerned about them just coming back. Delta would provide for them, regardless. She cared for the little guys. It wasn’t something she felt shame or annoyance over. The gobs had asked for nothing and saved Delta from a very… tedious start to her new life. Providing something to look forward to each time they left and returned to tell her stories of their fetch quests. It was such a normal act, the greeting of a friend and the talk that followed, that she felt more than a little grateful towards them. Shaking her head from such thoughts, Delta decided to do what she did best to pass time. Mess with the menu and hope for the best. With only 4 mana, there wasn’t much she could do. The mushroom grove had proven more than its weight in cost. A way to develop less poisonous mushrooms and maybe some more interesting strains. What other options did her less interesting purchases hide? Her fingers hovered over the spiders and bats. Delta held her finger down. Common Spider: A simple black spider. Creates 5 spiders per summon. These little hand-sized creatures can add atmosphere and some free decoration to your dungeon. 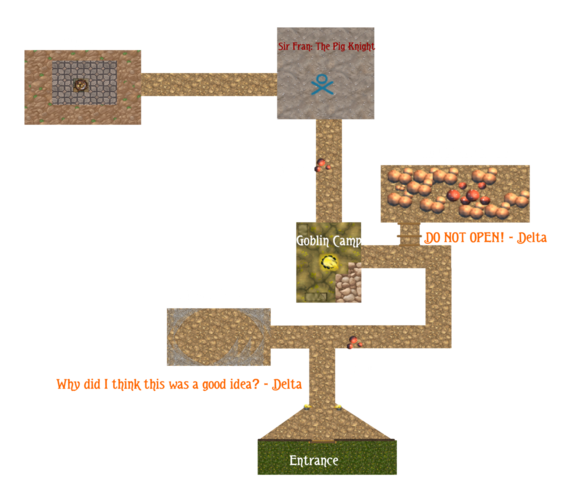 As basic creatures, they cannot evolve unless some unique element or being is absorbed by the dungeon. Common Bat: A simple brown bat. Creates 2 bats per summoning. This average sized bat hangs about your dungeon to give it atmosphere and freak out the most easily startled of adventurers. As basic creatures, they cannot evolve unless some unique element or being is absorbed by the dungeon. Basic creatures was a new term. Delta felt like some cliche popular girl as she read them aloud. “Such a basic spider,” she said to herself and then snorted. Delta paced a hallway, nodding to a Mushy as she passed. Basic creatures were a classification between monster and decoration. Not really what you wanted to protect the Core but something a creative dungeon might be able to use with some excess mana to make their dungeon look more...spooky. It seemed a little of a waste but Delta had learned her lesson after the umpteenth time since waking up. Dismiss nothing, everything is permitted. The line made sense in her head so Delta tried to imagine a use for the basic creatures. Could the spiders make some webs to slow people down? Then the bats could… scare people? So… just like what her menu said they would do. Delta mumbled as she turned and walked back down the hall. The pacing was great. Pacing let her feel like she was some CEO of Dungeon. Inc.
“Mr Cyclops, fetch me the 10 am readings! Dear Satan! Mr Werewolf! Have you seen these figures? Our Goblins are doing a protest! They want three more mushrooms a month!” Delta mimed throwing papers in the air. Laughing to herself until she calmed down; Delta sighed and tried to imagine taking any of this seriously to the point she got upset over spiders and bats. Delta just didn’t have time to be so asinine over the details. She’d get things done when she got them down. That was when Hob and Gob returned, carrying a bucket that sloshed and spilt a bit of liquid on the ground. Delta raced towards them like a kid who had been waiting all day for someone to bring her presents for Christmas. Gob poured the water onto the dungeon floor and Hob dropped some slimy rocks and pebbles. The water soaked in and the soil dried instantly as the water was turned into Mana and DP. Common Water Absorbed! Algae absorbed! Pebbles absorbed! Water themes unlocked in Menu! “You guys did awesome!” she praised as her mana jumped from 4 to 26. That water was pretty good for the mana refill. The DP was now sitting at 85 and Delta was starting to feel like a hoarder. “Hob and Gob best gobs!” Hob boasted with Gob enthusiastically backing him up with nodding. Delta let them go and was about to turn with a small cheer before another menu opened up. Mushroom Grove will now develop all mushrooms at a faster rate and for 1 less DP across all options due to water element! Delta waved the menu away. “Away demon! Away with you!” she hissed. It flickered and a new pop-up took its place. “Now, that's what I like!” Delta cheered and shrugged, purchasing the upgrade to spend it on something. She zoomed over to Hob and Gob to see a bag appear at their sides. It bulged and both gobs looked inside. “Rocks?” Gob asked and Hob grinned. “Rhucks!” he cheered and threw one at the Mushy in the tunnel. Delta gasped as the mushroom snarled, maw filling with that green liquid. Both goblins ran screaming as bits of sick looking spit hit the walls and splattered down. Well... Delta never accused them of being smart. It was pretty nice, however, that the basic goblin upgrades extended to her contracted monsters. She had a feeling that she was not truly catching on to the potential of the contracted monsters yet. Aside from being able to leave the dungeon, there had to be something else. Delta would have to keep waging war with the menus to tease the secrets out. A quick look at her menu showed her a few things. That was neat, except for strapping wooden fake shark fins on her goblins, Delta had no fish for people to fish for. Still, options never hurt until they trapped her in a spiralling trap of unable to choose what to purchase. But for now, she was rich in DP. Delta rubbed her hands as she saw a new tab unlocked on the menu. Research was a word that smart people messed about with. Delta knew, as a modest shut in, that research meant that part of the game where you were able to take old and boring units or buildings and make them into somewhat still relevant pieces in the later game or take early parts of the game and using it to stay alive. A Grove might be able to produce more for less, for example. Delta pursed her lip; the thought came down to how to reduce the cost a room? A whopping 20 mana was still a bank drainer at this point. “Core improvement? Mana generator?” she asked aloud. Her menu did not respond in any fashion. “Yeah… figured that would be too easy,” she agreed amiably. Delta didn’t begrudge the system for not letting her take such an easy route. Delta had the tools to carve herself a way to sustain herself and her monsters. It was just before her eyes in some fashion but Delta was in no rush to do something stupid when there was no direct danger yet. Instead, she decided to fill her dungeon with spiders. Delta would later regret this decision on many levels. Looking at her mental map, Delta decided that she needed to mix things up once she had more mana. A new tunnel and another room. For now, she created a room that connected to the first tunnel in the dungeon. It hollowed out and Delta took a small walkabout, admiring the almost perfectionist level of soil removal. She then flexed her fingers. She purchased the spiders with 5 DP and five of the things scuttled out of a hole in the middle of the room. The first thing that happened was that Delta vacated the room without a word. Perhaps it was a new life, a stolen slew of memories, the excitement of her new powers but the little fact that Delta did not like spiders seemed to have escaped her. She peered into the room and the spiders sort of… just moved around in interest in their new space. Maybe this wasn’t so bad; they almost looked cu- One of them turned to her and Delta fled. Eight eyes of death and nightmares stared into her Core-y soul. Delta knew she should have started with bats but the idea had just gripped her. With a very big shout, she ordered the spiders to begin to nest. It was the worst thing she had ever suggested since the phrase ‘Mushroom Grove’ had left her mouth. One by one, the spiders began to web around the corners of the room and danced threateningly at each other as they fought for space, the silky white threads quickly growing as the spiders didn’t need to catch any food. Delta tried to project a command to the spiders not to web in a middle of the room, leaving two parts of the walls bare of web. It was all part of her cunning plan! Delta felt pride rise up but it was quickly sent running as a spider poked out of the room to see where the cackling was coming from. The eyes… Delta wilted and fled. One day, Delta would make a monster that didn’t want to make her cry. Maybe something fluffy. Delta would later regret that thought on all levels. Now I'm scared of whatever fluffy monster that will be created. Just keep on teasing it for 50+ chapters please; imagination can do incredible things. Don't tease for 50+ chapters! Ignore him! He's a fool! i think he meant that hte author is to forget about it for 50 chapters then remember to start teasing it again. No. Both of you, no! He shouldn't tease at all or not for long. You forgot adding a luxurious white rabbit fur coat complete with bunny ears. Fluffy Bacon. For fluffy monsters I suggest candy floss spiders. A communal hunter of which only two need to stay alive to create the next generation . The reason they stay in dungeons is to keep out of the wind that blows them around like it's nothing. And they can float down from the ceiling in their gazillions entangling their victim in their body while every death on their side increases the stickiness of the situation hindering their victim(s) until they take a good time cleaning themselves. Let alone the absolute horrid side effects when taking care of them by burning them out. I gave in to temptation and binged through the rest of the chapters on spacebattles. I've rarely been so happy to discover that it was five in the morning. Thank you so much! I'm really glad you liked it! Looking foreword to what the future holds for her. so most research at the basic level is a waste of dp because its pretty easy for her to know about wooden swords tools and armor, same with their stone, copper, iron and steel versions. she will only need it for magic and monster related research.